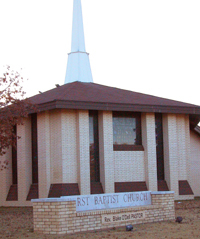 The First Baptist Church of Brady is located in the heart of Texas and with too many wild deer to count, it’s no wonder that Brady is a favorite place for hunters from all over the United States. The First Baptist Church is truly a beautiful church with warm woodwork, stained glass, and now has a “state of the art” audio and video system installed by the sound crew at Overdrive Productions. 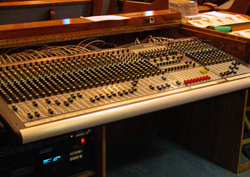 Music ministry is an important part of almost every church service and First Baptist Church of Brady was ready to upgrade their existing sound system . Their Sunday morning and Wednesday night worship services have been brought up to date with their new Integrated AV system! Overdrive installed lots of great audio video products including Bose 502-A Speaker cabinets, Crown amplifiers, Soundcraft Mixing Console, Ashly digital graphic equalizer, Furman distribution system, Sanyo LCD projector, Chief ceiling projector mount, Da-Lite Cosmopolitan Electrol motorized drop screen, and remote control, Aviom, Shure, and much more! Pastor Blake O’Dell is pleased with the new look the video and sound system gave the church and the church members complimented on the look and the life like sound. Steve Vinson and his crew enjoyed the friendly company of Pastor Blake, his church staff, and its members. You can hear Pastor Blake every Sunday morning on KNEL 95.3 FM at 11:00 a.m.
First Baptist Church also uses the latest and most comprehensive media software available today. MediaShout Presentation Software is designed for the ever-changing needs of your ministry. The tools included in MediaShout can help you deliver your media for worship services, preaching, Bible studies, singing, drama or musical performances. Making presentations that look professional can be assembled easily. Overdrive Productions is proud to be an authorized dealer for this exciting software! 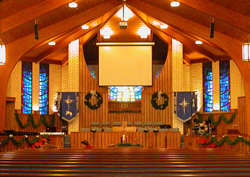 Overdrive Productions has many years of experience installing church audio and lighting systems. In fact, Houses of Worship are our primary business. Contact Overdrive Productions to discover how we can design a sound and light system to enhance the music experience at your place of worship.